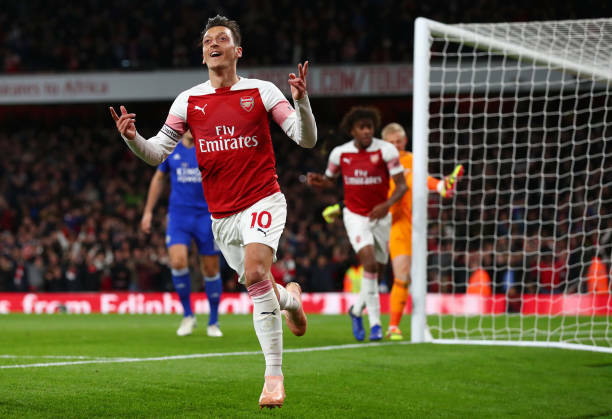 Arsenal playmaker Mesut Ozil has struggled for playing time under the stewardship of Unai Emery in 2019. Ozil missed the 2-1 victory over Huddersfield on Saturday due to illness and he has struggled with back and knee injuries. The 30-year-old has however, only made two appearances and just one start this year. Former Arsenal player Gilberto Silva opened up about the current situation and made it clear that in his opinion Unai Emery cannot afford not to make use of Ozil. “He has to be on the field,” the Brazilian told talkSPORT on Friday. “A player of his caliber cannot be on the bench, in my opinion. “People always try to find something to talk about with Ozil; why he’s not playing, when he’s playing he’s not doing well. But this kind of player, you have to give them responsibilities. Silva made it clear that Emery must give Ozil more regular playing time so that he can find his form and help propel Arsenal forward this campaign. “Because he’s a very creative player, he can provide for strikers the final touch,” he said. Silva then proceeded to compare the playmaker of Turkish origin with Arsenal legend Dennis Bergkamp. The former Invincible urged Ozil to look for Bergkamp for inspiration, to stay and become a club legend. See More: Turkish League Previews 21: Shinji Kagawa Fever Sweeps Super Lig, Can Anyone Stop Basaksehir? “In our time, we had Dennis Bergkamp,” he added. “Of course, Dennis didn’t have the same age as Ozil but he was very creative. Ozil has four goals and two assists in 18 appearances for the North London based outfit this season.